You sincerely vow “I’ll start tomorrow”. You feel guilty about procrastinating. You feel frustrated by your inability to stop procrastinating. You wonder what’s wrong with you. You feel like you never work hard enough. You’ve given up making New Year’s resolutions. You’ve been struggling with habit-change for years. You believe you have no willpower, or self-control. There’s nothing wrong with you. The problem is, culturally, we misunderstand self-control and motivation. To the point where it’s common to (unintentionally) demotivate ourselves. This book contains the psychology tools I developed and used to get myself from university dropout to PhD. I overcame my procrastination and poor study habits sufficiently to submit a timely, quality PhD thesis. I’ve since used these tools to help others change a range of habits. The biggest myth about self-control and willpower. The real cause of procrastination (Hint; there’s no such thing as ‘laziness’). Why relying on energy-intensive fallible willpower is overrated – & what to use instead. How long it really takes to change a habit (Hint; not 21 days!). The three fastest ways to turn a behavior into a habit. The common way we (unintentionally) demotivate ourselves – & how to stop. The motivation strategies that are the same for everyone. How to personalize the motivation strategies & create an evergreen list of highly motivating rewards for you. How to customize the behavior change strategies to change any habit. Between my university experience and eight years as a volunteer Lifeline telephone counselor, I realized we have an epidemic of procrastination, anxiety, chronic stress and underperformance. This epidemic is pervasive throughout our culture, but is especially and devastatingly evident in our education and work places. 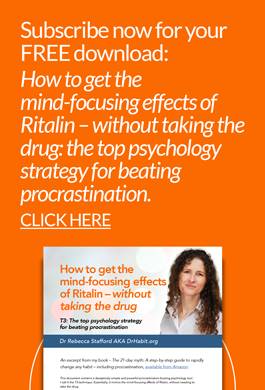 There are far too many people suffering unnecessarily for lack of simple psychology tools. There is nothing wrong with you. You have plenty of willpower. I know how hard you try. You simply need the psychology tools to better understand how to motivate your brain. Where do I get The 21 day myth? The book will be available from Amazon and elsewhere from an estimated November 2018. 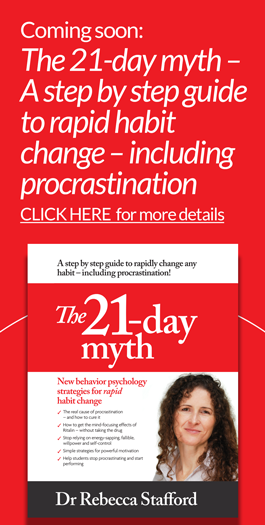 Once The 21-day myth is published, you’ll be able to purchase from a link on this page. You may wish to subscribe to my blog newsletters to ensure you don’t miss out on a copy of The 21 day myth plus you get to share in my exhilarating struggle as I finish and publish this effing book.